Alex Hitrick. Photo by Scott Mulford. Broadalbin-Perth High School placed a total of eight athletes on the 2014 Foothills Council Cross Country All Star team. 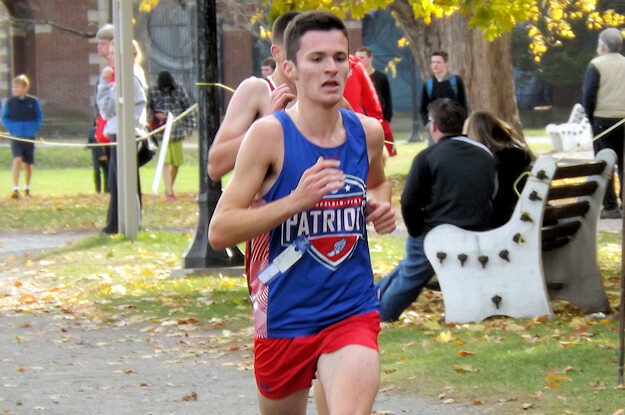 Seven members of the Lady Patriots cross country team earned honors. Seniors Coreena Monroe and Sarah Naple, and freshman Jordyn DeNeuville and Mackenzie DeZolt were selected to the second team. Seniors Alexandria Opalka and Victoria Opalka, and junior Cadey Nolan were chosen as honorable mentions. Junior Alex Hitrick was a first team selection for the BPHS boys team. From Amsterdam High School, freshman Olivia Lazarou was named a girls first team selection. Senior Alyssa Turo and junior Jonathan Knack were honorable mentions. The Broadalbin-Perth Lady Patriots volleyball team is moving on to the 2014 New York State Public High School Athletic Association (NYSPHSAA) championships after a 3-0 regional victory this past Saturday over AuSable Valley High School of Section 7. The Lady Patriots won by scores of 25-19, 25-15, and 25-14 to advance to the final four this weekend November 15-16 at the Glens Falls Civic Center in Glens Falls, NY. Broadalbin-Perth (19-2), the Section 2 Class C champions will begin pool play on Saturday, November 15 against teams from Mattituck (Section 11), Eden (Section 6), and Spackenkill (Section 9) in the afternoon with the Lady Patriots first match against Mattituck (according to the nysphsaa.org website). The top two teams advance to the Class C finals on Sunday, November 16 at 2pm. The Amsterdam High School Lady Rams swim team scored 15 points to finish 17th at this past weekends Section 2 Swimming and Diving Championships held at Shenendehowa High School. The team consisted of six members of the AHS girls team: senior Justine Youngs, freshman Kayla Dzikowicz and Paige Bertuch, eighth graders Lauren Santiago and Julianna Busseno, and seventh grader Grace Patrei. Youngs advanced to the finals in the 200 yard individual medley and earned a 16th place finish. She was also part of a 200 yard freestyle relay team with Busseno, Dzikowicz, and Santiago that finished 13th. Dzikowicz came in 17th in the 100 yard breaststroke, and Youngs finished 18th. Busseno was 31st in the 100 yard butterfly, Bertuch came in 37th in the 100 yard backstroke, Santiago was 38th in the backstroke and 40th in the 100 yard freestyle. Patrei was part of a relay team with Dzikowicz, Santiago and Youngs that finished 14th. Albany Academy for Girls won the team title in Division 2 with a total of 428 points. Official results were posted on the NYSPHSAA’s website nysphsaa.org.